June 23rd is National Pink Day. Yes, there's a day specifically set aside to celebrate the color pink. Of course, you might want to crochet something in pink on any day of the year. It's a pretty color that's mood-bosting and easy to work with since you can see the stitches well when you work with a light color. Pink is great for any project that requires a feminine or floral touch and is often used for babies, home decor and blankets. Here are ten pretty pink crochet patterns for you to enjoy. 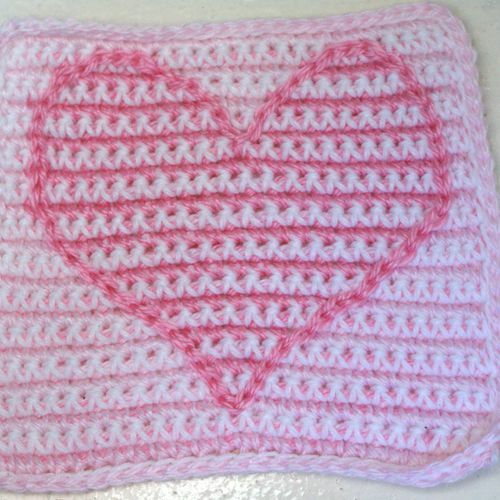 Pink and White Baby Afghan Square With Heart Design -- Baby Girl Colorway. Photo © Amy Solovay, Licensed to About.com, Inc. This pretty pink and white crochet heart pattern is designed to be an afghan square. You can make a beautiful baby blanket for a little girl using this free crochet pattern. The crochet square pattern could also be adapted to create a motif-based scarf. If you just want to make a simple crochet baby blanket then this beginner's crochet pattern is a great one to use. Get out your favorite pink yarn and get your crochet hook flying to quickly work up this free blanket pattern. Girlie's Crochet brings us this free crochet scarf pattern worked in beautiful bold pink yarn. It uses several different fun stitches including v-stitches and picots to create terrific texture on a design that uses only one color. You'll find it in our roundup of 100 free crochet scarf patterns. That roundup of 100 free crochet scarf patterns also includes this pink scarf pattern. This one from By Hook is made in a lighter color of pink so it has a completely different style effect from Girlie Crochet's beautiful bold pink scarf. It has a cabled design but it doesn't rely on post stitches so it's a beginner cabling crochet pattern. You'll feel pretty in pink wearing this beautiful beaded pink bracelet. It uses wire crochet techniques and two different types of beads for a beautiful impact. It's a terrific piece of luxurious crochet jewelry that's easy to make using the free pattern. Peach, Pink and Yellow Checkerboard Baby Afghan Square. Photo © Amy Solovay, Licensed to About.com, Inc. Pink goes perfectly with peach in this terrific free crochet checkerboard pattern. Use the free crochet square pattern to create a pink and beach crochet baby blanket. Alternatively, use the pattern as is to create dishcloths and other square items. Fuzzy Pink Baby Afghan Square - This Baby Afghan Square Is Crocheted Using the V-Stitch Granny Square Pattern. As Shown, It Would Be Great for Making a Baby Blanket for a Baby Girl. This Versatile Pattern Could Be Crocheted in a Variety of Other Yarns. Photo © 2010 Amy Solovay, Licensed to About.com, Inc. This is a fun variation on a classic granny square. It uses v-stitch for its unique design. You can use this to make any square motif project including cushions and blankets. If you're looking to dress a whole room in pink granny square crochet then this is the pattern to bookmark. Want to make something really sweet? This pink crochet cupcake square pattern can get you started. A set of them would make cute dishcloths or placemats. They can also be combined together to make blankets and other big projects. Enjoy this one! Although it's shown here in more of a peach of yellow color, you could definitely make this cute crochet baby bonnet in pink yarn. Pink is often used for baby items and items for little girls and this is a great example of an item that would look just right in the color pink.